In this gripping first-hand account of the Occupy Wall Street movement, filmmaker and former high school teacher Dennis Trainor Jr. takes an inside look at how a New York-based protest against corporate greed and economic inequality in the autumn of 2011 sparked a full-scale street revolution that continues to send shock waves through the American political system. Trainor weaves commentary from organizers, activists, and leading progressive thinkers with riveting street-level dispatches from New York's Zuccotti Park, Washington DC, and beyond. The result is a passionate and clear-eyed look at a movement founded on the core belief that the American political and economic system should "place human need above corporate greed" and do something about growing inequality. Narrated by Trainor, the documentary features filmmaker Michael Moore, Dr. Cornel West (Princeton University), comic/author/activist Lee Camp, journalists Nathan Schneider (Harper's, The Nation), Naomi Klein (The Nation) and more. DVD contains two versions: a full length version (58 minutes) and an edited version (57 minutes). A film by Dennis Trainor, Jr.
Edited by AJ Russo and Dennis Trainor, Jr.
"This is not amateur hour. This is a movie as well made as any Hollywood blockbuster." "(American Autumn) is calm and smart, offsetting its stridency with discussion, music, even humor, while issuing a call to arms." "American Autumn impresses most where many docs disappoint, expanding its scope without short-changing the wider subjects it covers." "American Autumn is a provocative social critique and relentless piece of engaged journalism. Up against institutionalized corporate greed, Dennis Trainor's documentary doubles down on the vision of an equitable economy; he demands you pick a side." "...this necessary and informative documentary looks at the faces behind the Occupy Wall Street movement... it is an effective, and heartfelt, clarion call." "In the fall 2011, Occupy Wall Street encamped just three blocks from the front doorstep of the university where I teach. We had a front seat to a revolution. Quickly the movement went viral, as Occupy encampments sprouted up in nearly 100 counties and more than a thousand cities around the globe. With clarity and earnestness, American Autumn by Dennis Trainor, Jr. explains why the movement is so powerful and so necessary. 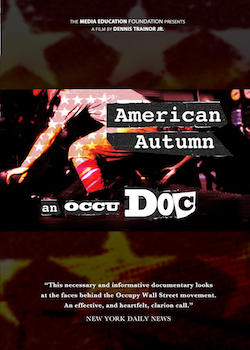 From health to education, from corporate greed to student indebtedness, from unsustainable levels of inequality to unsustainable levels of military spending, American Autumn gets Occupy right and provides us with a document that lays bare the times we are living in." "an impassioned celebration of the Occupy Wall Street movement"
"If you want to understand why millions joined the Occupy movement in the US watch American Autumn. The film successfully connects many different causes to one huge movement for change, making clear that it is one struggle no matter where we stand." "We are the ones we've been waiting for. Spread the good news -- watch and share American Autumn with all your friends and family." "Dennis Trainor, Jr, is no outsider, but a gonzo journalist at these events."